J. Robert Oppenheimer, also known as “the father of the atomic bomb”, was an American nuclear physicist and director of the Los Alamos Laboratory (Manhattan Project). With a project so big that involved the hard work of hundreds of gifted scientists, it may appear quite undue to give so much credit on the shoulders of Oppenheimer. Oppenheimer is, however, still the sole creator and inventor of the nuclear bomb to most people in the world. 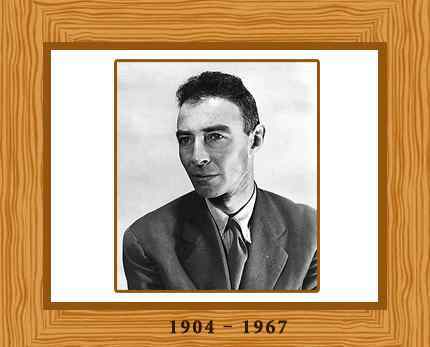 Born on 22 April in 1904 in New York City to a rich Jewish father, Oppenheimer became one of the brightest students at Harvard University at a youthful age of seventeen. He also attended Cambridge University in England for higher studies, where Ernest Rutherford, the famous British chemist and physicist, was his teacher. Oppenheimer acquired his Ph.D. from University of Göttingen in Germany, studying under Max Born. Although he spent most of his time carrying out research and publishing books about quantum theory and theoretical physics, he was also interested in the classics and Eastern philosophy. In 1929, Oppenheimer topped in all the units at the University of California and the California Institute of Technology. Most of the times, Oppenheimer had almost no time for his personal life. The growing popularity of Nazism in Germany during the 1930s, however, became a major event in his life, as it led him towards politics and resistance against the European fascist movement. Oppenheimer subsequently joined left-wing politics, and became associated with several left-leaning organizations, which were linked to the Communist Party. Niels Bohr and other European scientists informed their American contemporaries about the Kaiser Wilhelm Institute’s successful attempt of splitting the atom in 1939. President Roosevelt was much concerned that the Nazis may utilize this extraordinary technology to create an atomic weapon. This fear led him to institute the Manhattan Project in 1941. Oppenheimer was appointed the scientific director of the project. He advised that the project be housed at Los Alamos in New Mexico. After extensive hard work and rigorous struggle, the first nuclear bomb was exploded on July 16, 1945, with the power of approximately 18,000 tons of TNT, at Alamogordo Air Force Base in southern New Mexico. Within one month, two atomic bombs were dropped on Japan. The event almost instantly ended the war, after which Oppenheimer was he became director of the Institute for Advanced Study in Princeton, New Jersey until he retired in 1966. He was also made the chairperson of the U.S. Atomic Energy Commission in 1947 until his contract was cancelled in 1954 when he lost his security clearance. Oppenheimer, due to his conscience and regrets over making such horrible weapons of mass destruction, opposed the development of the hydrogen bomb in 1949. The bomb is often thought to be the Truman administration’s answer to the Soviet acquisition of the atomic bomb. Due to this unexpected move, Edward Teller, his colleague at Los Alamos, was made the director of the new project. Oppenheimer’s patriotism was also questioned and he was even accused of “communist sympathies” due to his past political affiliations. For the rest of his life, he shunned politics and performed his duties as the director of the Institute of Advanced Study at Princeton. Oppenheimer died of throat cancer in Princeton on 18 February in 1967.